This is the BEST PJ on the market today. It features Super Soft 100% Thermal Cotton. The PJ has fant.. These adorable Holiday Dog Pajamas will make your little angel a perfect 10 on the cuteness scale. T.. Cozy & Sweet PJs for your Doggy - Available in 3 colors! SO SWEET! Waffle weave thermal knit with faux back flap, decorative buttons and contrast topstitchin..
Soft & comfy pajamas with bib and embroidery details! 80% cotton, 20% polyester. PO Size Chart .. 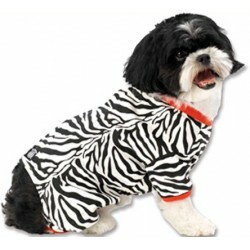 Elephant Print Pajamas for Dogs - available in 2 colors! Cozy & sweet pajamas with bib and embroidery details for your precious fur baby! 80% cotton, 20% pol..
Fun, cozy pajamas with bib and embroidery details! 80% cotton, 20% polyester. PO Size Chart ..
Sweet lightweight pajamas that are perfect for the warmer weather! 95% cotton, 5% spandex. PO Si..
Adorable & cozy pajamas with bib and embroidery detailsfor your sweet pooch! 80% cotton, 20% polyes..
Adorable, sweet & pink velour tracksuit with crown embroideries, rhinestones, silver piping, and ful.. This is the BEST PJ on the market today. It features Super Soft 100% Thermal Cotton. The PJ has fan..
Soft, sweet & comfy! This royal blue velour tracksuit with crown embroideries, rhinestones, silver p..
Snuggly pajamas with bib and embroidery details! 80% cotton, 20% polyester. PO Size Chart ..
Royal Brown velour tracksuit with Paw and Top Dog embroideries, gold piping, and full lining. Velcr..
Trendy cotton knit zebra print pajama with red trim. Adorable and practical pjs. They help to red..
Adorable 100% Cotton Turkish Terrycloth Bathrobes. The boys robe features an embroidered Gold Crown .. Girls dog bathrobe features an embroidered silver tiara for your little princess pup. The bathrobe h..